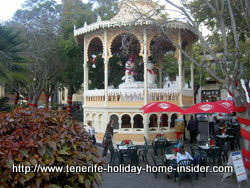 Cheap Tenerife restaurants with views or other surprises. 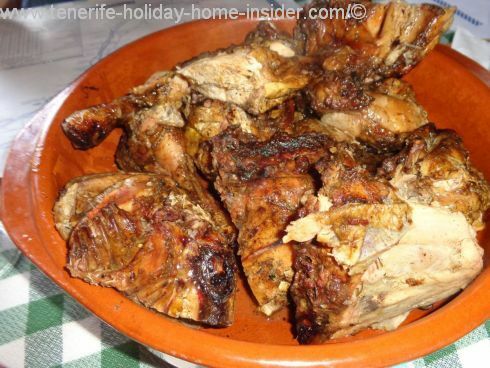 Are cheap Tenerife restaurants a reason, not to cook yourself? Eating out often beats the cost of organizing and preparing food yourself. Packing a picnic basket may pay you for feeding many, though. 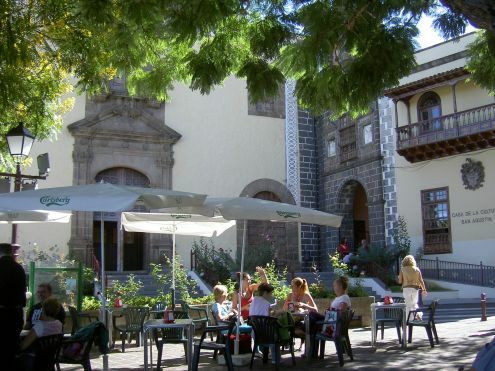 Do a trip for sight seeing and Tapas eating al fresco in La Orotava. Do it while you enjoy a nice break on its center court called Plaza la Constitución by the bridge. This location also gives you breath taking town views to the coast. You see the park's Christmas pavilion on the photo. The bistro restaurant is in its back and my preferred seating place further to the left of the park. Point at the Tapas dishes which you want as well as to your table outside under the large old trees. However, trying to speak a little Spanish helps, too. The four main reasons why Tapas food is there to stay in Tenerife as well as all over Spain. Otherwise, there are many cheap Tenerife restaurants, where an unexpected bonus is waiting for you. Absolute best, low cost gourmet restaurant in Tenerife. You may have known the superb restaurant Los Olivos of Santa Ursula in Tenerife which has become history. Well its Scotsman owner Richard Etherington has been chef for the Orotava Family Hotel Victoria for quite a while after closing his Santa Ursula business. We were eating at the hotel a truly magnificent 3 course meal at the end of July 2013, before booking a suite. The price of this daily menu was only Euro 10,50 per person. It included a glass of proper white or red Tajinaste which is one of best local Orotava wines. However, we were rather disappointed when we returned about a week later in August with a group of seven people with a little boy. Then, Richard was on leave and didn't cook for us. Only the starters and the strawberry mousse desert were loved by everybody including our two year old boy. This shows you that the best Tenerife restaurants are never the same, when they change cooks. Cafeteria La Cayaya has been shut down in summer 2018. It was not only an economical, clean and good serviced tapas bar by the Puerto Cruz harbor but, had another surprise waiting for you. 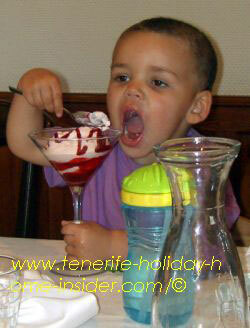 There are several low cost Tenerife restaurants with Chinese cuisine all over Tenerife Island. Not all serve buffets and not all are in such convenient location like the China International. This is one of Tenerife Restaurants which is not gourmet but, perhaps, I am terribly spoiled as far as Chinese Cuisine is concerned. Some of my friends like to eat there. This eating place is in La Paz of Puerto de la Cruz de Tenerife. The family owned Austrian restaurant Restaurante Tiroler Alm is renown for its most delicious Applestrudel as well as simple value for money but, good home style cuisine. Ocean Bar Restaurant Vista Paraiso which is a must to know for having a tasty snack or lunch at an unbeatable Orotava look-out with a paradise landscape. Tenerife eating out off the beaten track at a cheap tapas bar or its adjoining restaurant for otherwise expensive Cherne fish at Beach Los Silos beach is well worth it. as they often run out of food on week-ends and holidays. This Bistro is only open on week-ends . Winter business hours: Every day except Sunday afternoons, Mondays and Thursdays from 11 a.m.-3.p.m. and 6 p.m. - 10.p.m. Take away in Tenerife Asador Monturrio wood fire chicken. 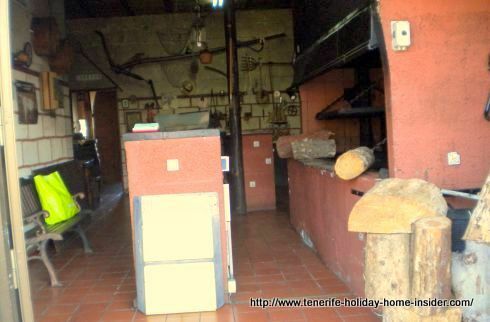 How get to the delicious wood fire barbecue chicken of the Monturrio Take Away in Tenerife ? From TF5: Take Exit 39 La Vera, pass an old castle on your left and proceed towards La Vera (old Carretera) for about 50 meters. Turn left in direction Puerto de la Cruz. Go strait down and find parking before you see a big red building on the bottom. The restaurant is on the left opposite a big fenced-in vacant plot. Unfortunately, this barbecue bar restaurant only seems to prepare food at lunch times on week-ends. Your best bet for a yummy chicken on the grill is smoke which comes out from its building's chimney. Paraiso Bar Restaurant daily lunches. There are many who favor the Paraiso bar Bc and cafeteria which is close to C/Monturrio Road at no. 25 near the bus stop of Longuera for its daily menus. All is served with rice, potatoes or French fries and mixed salad. White bread is optional. The price is € 4 for any of the meals. This is without drinks and desserts. You get delicious wholesome food. 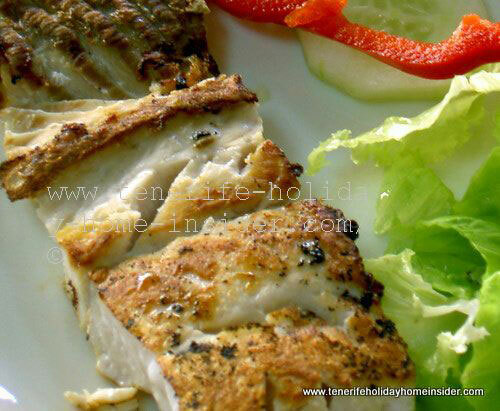 Its good, grilled Sea Bass called Cherne in Spanish which is depicted beside is absolute value for money and a Monday favorite with many guests. Our Tenerife holiday home in ideal spot for cheap eating out at the border of Romantica I in La Longuera. It may be interesting to read a New York Times article where the question is if fast food which is said to be economical is really cheaper which read here. From Tenerife restaurants cheap back to Tenerife restaurants, some of which are for fine dining.